Product prices and availability are accurate as of 2019-04-20 12:31:16 UTC and are subject to change. Any price and availability information displayed on http://www.amazon.com/ at the time of purchase will apply to the purchase of this product. 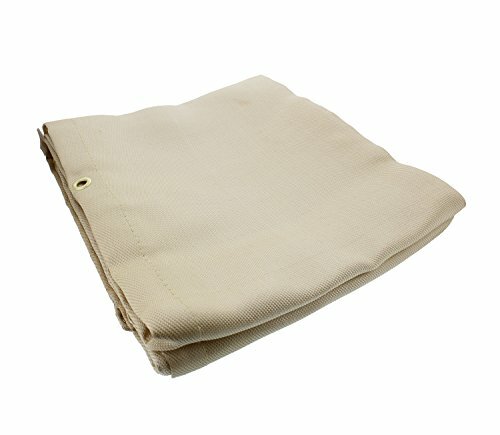 Prevent accidents, injuries, and property damage that can be caused from sparks, flares, and splatter with the ABN Heavy-Duty Fiberglass Fire Retardant Blanket - Welding, Smoker Fireproof Thermal Resistant Insulation. It arrests sparks and short-term exposure to flame as well as insulates from heat. It is constructed from fiberglass with up to 1,000-degrees Fahrenheit working temperature. The tight weaving pattern keeps it bound together and reduces wear and tear for ultimate durability. It stands up to long-term, repeated use and includes a reinforced hem with 3/8-inch brass grommets for secure and easy hanging. It folds up to a compact size for easy transport, simple storage, and quick organization. To best suit your needs, choose between a 4-foot x 6-foot or 6-foot x 8-foot blanket. WARNING: This product can expose you to chemicals which is [are] known to the State of California to cause cancer and birth defects or other reproductive harm. For more information go to www.P65Warnings.ca.gov.